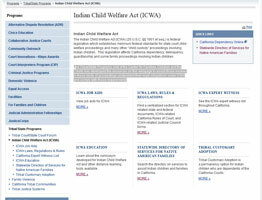 The Tribal/State Programs Unit of the Center for Families Children and the California Courts have created a webpage to assist those involved in Indian Child Welfare Act (ICWA) proceedings. The page can help them understand their legal obligations under ICWA and comply with those requirements. Subjects covered include ICWA job aids; law, rules & regulations; expert witnesses; education; directory of California services; and tribal customary adoption. Visit the the California Courts website to learn more. This entry was posted in Contact Information, Laws and Regulations, Resources and Support and tagged California. Bookmark the permalink.